Opioid prescribing for minor injuries — for which such powerful pain medications may not even be necessary — remains high and varies widely by state, despite an overall downward trend, according to new research by the University of Pennsylvania. Many states have responded to the national opioid epidemic by limiting how many pain pills doctors can prescribe, contributing to the decline in opioid prescriptions filled at pharmacies across the country. But a Penn study, published Tuesday in Annals of Emergency Medicine, suggests that to truly tackle the opioid epidemic that has strained communities like Philadelphia, states may need a more granular approach. "Previous studies were sort of the 30,000-foot view. It's very hard to figure out what's the underlying problem," said M. Kit Delgado, an assistant professor of emergency medicine and epidemiology at Penn and the study's lead author. "Now, when you limit it to specific conditions, such as a minor injury or all patients that got opioids after a specific type of surgery, we can better understand if there's still variation or a lot of prescribing." Researchers at Penn analyzed commercial insurance data from Optum Clinformatics Data Mart for 30,832 adults ages 18 to 64 who had been treated in an emergency department for a sprained ankle and had not filled an opioid prescription in the six months prior to their injury. The study looked narrowly at ankle sprains in the emergency departments to zero in on trends researchers suspected may be lost in broader opioid prescribing data. Overall prescribing trends don't discern whether the initial script was for a major medical incident that could lead to chronic pain, such as back surgery, or a lesser injury that should not require ongoing management. An ankle sprain is a minor injury that should heal in about two weeks, meaning that for those patients there usually is no need for ongoing pain management, Delgado said. "If we saw all of a sudden someone who got opioids for an ankle sprain started filling more down the line, we could be more confident that it probably wasn't related to the development of chronic ankle pain," he said. About 20 percent of people treated in the emergency department for a sprained ankle left with an opioid prescription in 2015. That's a decline from 28 percent in 2011. Prescribing varied widely among states, from a low of 2.8 percent of ankle sprain patients in North Dakota to 40 percent in Arkansas in 2014 and 2015. In Pennsylvania 13.2 percent of ankle sprain patients were prescribed an opioid, as were 10.9 percent of patients in New Jersey. Ankle sprain patients who received prescriptions for larger amounts of opioids, at least 30 tablets of oxycodone of 5 mg or an equivalent intensity of another medication, were five times more likely to transition to prolonged opioid use compared with patients prescribed no more than 10 pills. The study defined prolonged use as filling at least four opioid prescriptions within six months of the ankle sprain. What's more, researchers were shocked by the volume of opioid prescribing for such a minor injury that is typically treated with anti-inflammatory medicine, ice packs, and elevation. 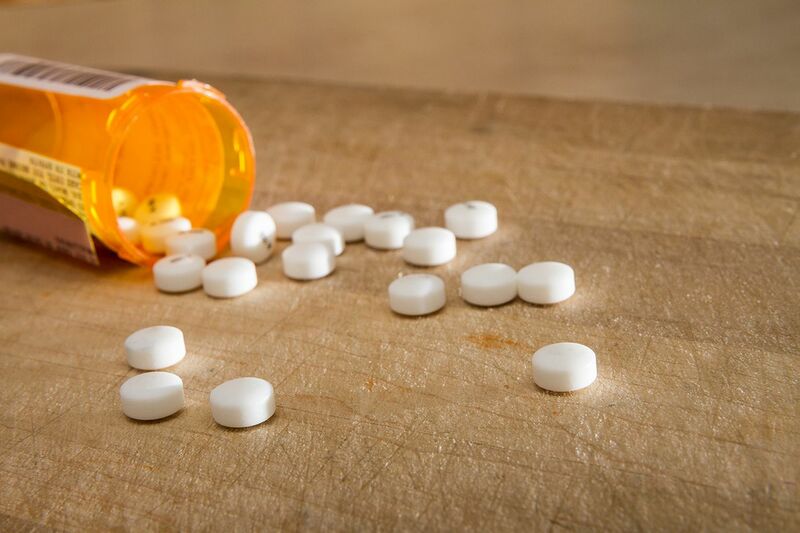 Opioids are not part of the standard treatment protocol for most patients, though they may be prescribed at the doctor's discretion, Delgado said. "Given that we cannot explain this variation after adjusting for differences in patient characteristics, this study highlights opportunities to reduce the number of people exposed to prescription opioids for the first time and also to reduce the exposure to riskier high-intensity prescriptions," he said. In response to the steady increase in opioid deaths, at least 22 states — including Pennsylvania and New Jersey — have enacted legislation to limit patient access to prescription opioids. Between 2013 and 2017, opioid prescribing declined 29 percent nationwide among patients insured by a Blue Cross Blue Shield plan, according to a July report by the Blue Cross Blue Shield Association. Prescribing declined 41 percent in New Jersey and 35 percent in Pennsylvania during that period, according to the report. The Penn study's 2011-15 data set predates many of the state-level changes that have helped reduce opioid prescribing. Another limitation: Patients covered by Medicare and Medicaid, and uninsured individuals, were not represented in the study. Prescribing habits could vary among primary-care practices or ambulatory care centers, both of which commonly treat ankle sprains and are not represented in the study. Still, the findings point to the potential benefit of better tailoring prescribing guidelines, the authors said. "There is a clear need for further impactful guidelines similar to the Centers for Disease Control and Prevention guidelines that outline more specific opioid and non-opioid prescribing by diagnosis," Jeanmarie Perrone, a professor of emergency medicine and the study's senior author, said in a statement. "It raises more questions than answers, and we need to have a better understanding of why there's so much variation," he said.